Stekken TIS consist of three major types of crystalline fertilizers, 100% soluble in water. It is specially formulated to cater oil palm's nutritional needs and targeted for different phases of growth. Stekken TIS are formulated from a highly refined raw materials enriched with macro and micro nutrients. At our facility in Malaysia, all fertilizers are carefully manufactured and produced to meet oil palm's ever changing requirements and customers' expectation. pH Balancer is specially formulated to assist TIS to deliver and transport all applied nutrients via its vascular system. When Stekken TIS fertilizers are injected in the palm's trunk, nutrients are transported all over by means of transpiration and root pressure (0 - 100 kPa). 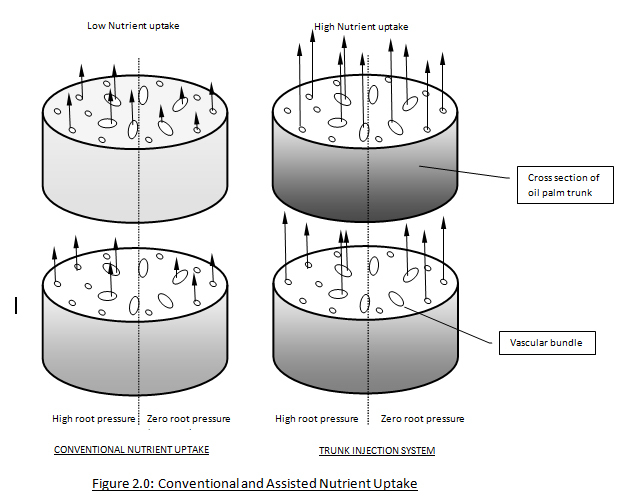 Relying on both transpiration and root pressure for nutrient uptake are highly dependent on season. In certain circumstance, it may not develop any pressure at all, thus, slowing down the process of nutrient uptake. Naturally, molecules and dissolved ions move in plants spontaneously down their concentration gradient by diffusion. TIS fertilizer couple with pH balancer CREATS MOVEMENT and FORCE molecules to move against their concentration gradient to places where it can be stored and used. This is made possible by making the membrane more permeable, added with natural plant hormone and energy (ATP) creating a special transports moving nutrients in palms with both direct and indirect active transport phenomenon. 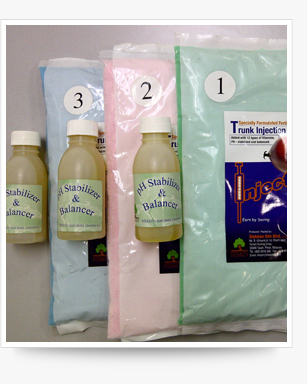 In order to complete and fully enhance the efficacy of the system, both pH Balancer and TIS fertilizer had to be mixed together, otherwise fertilizer will be left suspended around the injected area. In line with its aim to be a world class centre of excellence in TIS science, Stekken is actively involved in the Research and Development techniques for the betterment of the nature and plants and in return improve yields and profit streams of oil palm.